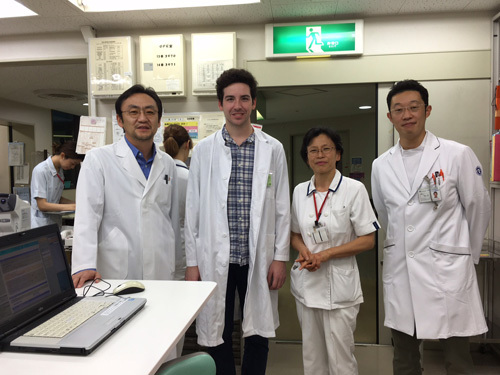 Before my clinical internship at the Department of Ophthalmology at the Nagoya University Hospital, my knowledge of this specialty was only theoretical. But after my two weeks of rotation there, I’ve got a much better insight into this subject. The department was very well organized. I got a full schedule about my rotation, so it was always very clear when I should be somewhere and what I could see and learn. There were a lot of enthusiastic and very friendly doctors, who helped me very much with my studying and to get a deeper understanding of Ophthalmology. 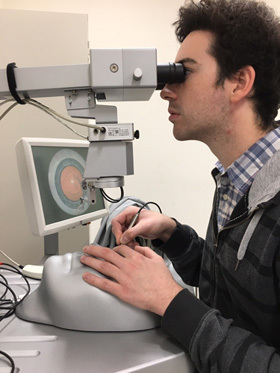 I could experience a lot of different things: I could practice micro suturing and spent a lot of time in the operation rooms, where I could see many various operations, like vitrectomy, cata-ract surgery or glaucoma surgery. At first, I felt a little bit uneasy, watching the incision of an eye, but already at the beginning of the second operation, this discomfort was gone. I found the micro surgery of the eye very fascinating and completely different than other surgeries I’ve seen before. For me, the surgery of the eye – in poetry often portrayed as the “window to the soul” – also has some kind of aesthetical aspect. I even got the chance to practice at a sur-gery simulator, which was both informative and fun and one of the highlights of my rotation. Besides, I could also spend some time at the inpatient and outpatient clinics and get the chance to see examinations and some of the various and high technology machines. I could watch ERG (Electroretinography), ROP (Retinopathy of prematurity)-examination of the newborn and examine patients by slit lamp examination and funduscopy, in which I could improve after some time. Furthermore, some machines were demonstrated to me on my own eyes, so I got the chance to measure the axial length of my eyes, get a measurement of my intraocular pressure, a picture of my fundus and even an OCT. With my high myopic eyes, it was reassuring that everything seemed to be normal. I had a very interesting and educational time at the Department of Ophthalmology at the Na-goya University Hospital, thanks to the great team there. While ophthalmologists only study about 23 mm (in my myopic case 27) of the human body, I experienced it as a very interesting medical specialty with a lot of variety and this rotation has definitely deepened both my un-derstanding and interest in Ophthalmology.